KN Networks presents to us ‘Rap Up UK Showcase’. 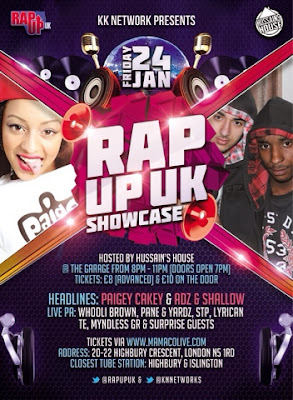 The respectable Rap Up UK will hold their first event with headliners Paigey Cakey and Adz & Shallow this month. Taking place at London's ‘The Garage’ - the night will also see live PR from Whooli Brown, Pane & Yardz, STP, Lyrican, TE, Myndless GR and surprise guests! Date: Friday, 24 January, 2014!